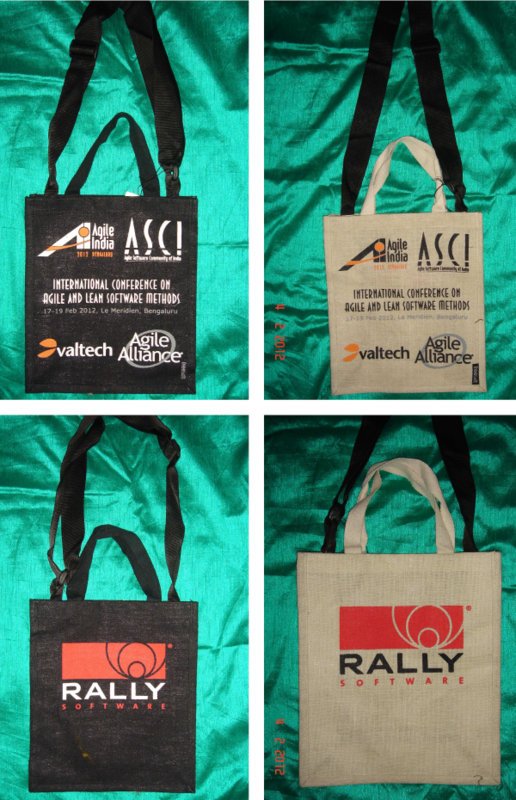 Thanks to the Freeset Team for making these wonderful eco-friendly conference bags. This entry was posted in Agile India, Agile India 2012 and tagged Agile India, Agile India 2012 by Naresh Jain. Bookmark the permalink. Naresh Jain is an internationally recognized Technology & Product Development Expert. Over the last decade, he has helped streamline the product development practices at many Fortune 500 companies like Google, Amazon, HP, Siemens Medical, GE Energy, Schlumberger, EMC, CA Technologies, to name a few clients. These days, he is more focused on engineering excellence and product innovation. In a nutshell, hire him as a consultant/mentor, if your entire organization wants to move beyond the Agile and Lean mindset. Naresh is leading two tech-startups, which build tablet-based adaptive educational apps for kids, conference management software and social-media search tool. His startups are trying to figure out the secret sauce for blending gamification and social learning using the latest gadgets. Naresh founded the Agile Software community of India, a registered non-profit society to evangelize Agile, Lean and other Light-weight Software Development methods in India. Naresh is responsible for conceptualizing, creating and organizing 50+ Software conferences worldwide.